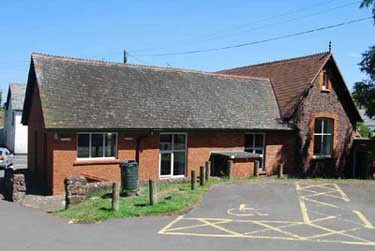 The Energy Saver heating solution has been installed in many village and meeting halls across Great Britain since 2007. There are case studies for several of the village halls, click on the ones that are underlined to learn more. Most of our hall customers get grants for the upfront cost of the solution. There are many different grants available depending on your location. There are also national schemes that can fund up to £ 10,000. 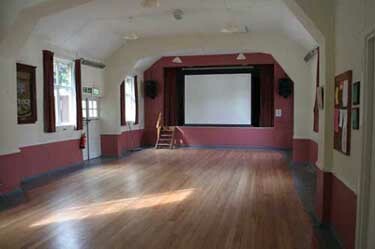 Village halls often have the problem where end users raise the temperature and then forget to lower it when leaving, forcing the caretaker to visit the hall after every use. Our recently launched optional Enhanced Village Hall (EVH) solution takes care of this problem, as it enables automatic running cost control with no caretaker involvement. Users have their own simple control where they can alter the temperature, and there is a locked away master controller which is programmed to set back the temperature automatically to the desired background temperature. Optionally there is also a movement sensor which automatically raises the temperature with 4 degrees C. The temperature drops back 4 degrees 20 minutes after people leave the hall. A further option is smartphone / tablet control (requires broadband at the hall). Contact us for further information about the Energy Saver and grants. 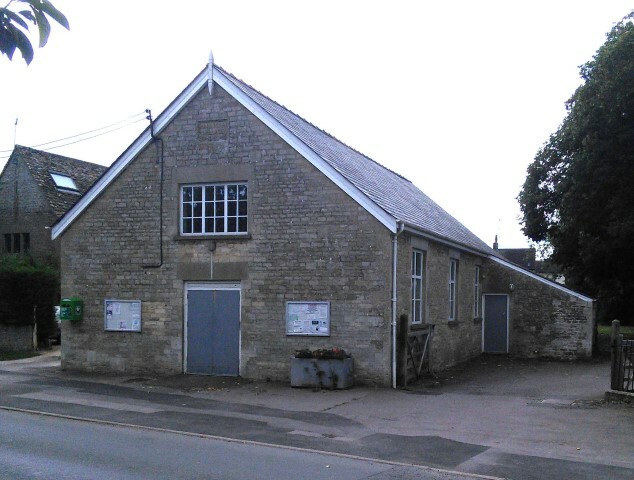 Siddington Village Hall was built in 1921 on land off Ashton Road in the centre of Siddington village which is approximately 2 miles south from the attractive Cotswold town of Cirencester in Gloucestershire. "In the spring of 2016 we decided to update the heating in the main hall at our village hall site. This was changing from elderly electric night storage heaters to an Air to Air Heat Pump System. After getting a number of quotes from different companies we selected EHS due to the professionalism of the quotation process, good price and specified capability of the proposed system. Hans from EHS was very happy to answer all our questions about the details and capabilities of the system and offered to attend a meeting of our trustees/management group to explain these details. Hans also recommended applying to the Lottery to help cover the cost, which proved very beneficial as we were successful in being awarded a grant to cover the complete costs and in a very short timescale. Once the order was placed the installation was quick and trouble free. Our overall electricity costs for the year have reduced by over 40%. 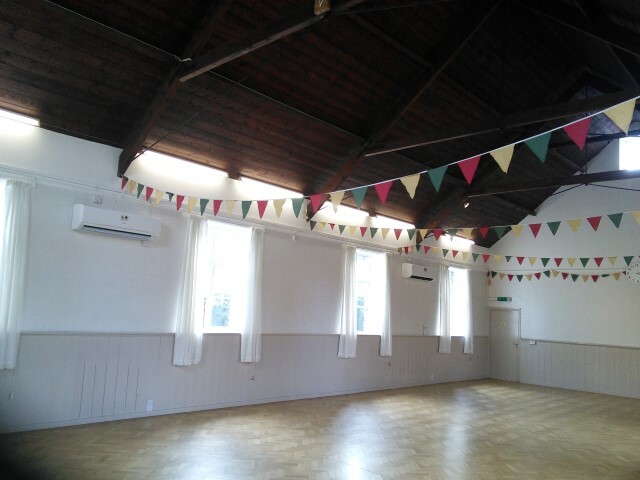 The hall is always pleasantly warm, rather than over warm in the morning and cool in the evening. All our regular users have commented how effective it is. The system is very quiet both inside and outside. We have close residential neighbours adjacent to where the external units had to be sited but have had no complaints about noise. Increased available floor space. 4 commercial floor-standing storage heaters and their guards were replaced by two discrete wall-mounted units. Based on the success of the system installed in our main hall, we have now commissioned EHS to install an Air to Air Ducted heating system for the rest of the building which includes our kitchen, Meeting room, toilets and storage areas." Kilve Village Hall, Kilve Nr Bridgewater Somerset is a Victorian building with a floor space of about 110m2 and ceiling heigh of 4 metres in the main hall, and 40m2 in the secondary hall. Environmental Heating Solutions Ltd was contacted by the Kilve Village Hall committee in the spring of 2010, and we installed one unit in the main hall, and one unit in the secondary hall in late 2010. The units have been operating very well with no service interruption since that date. Logie Coldstone is a small village located in west Aberdeenshire on the edge of the Grampians. As you would expect from the name it is not a very warm place. The hall was built in 1897 and by 2003 it was in bad shape. After extensive fund raising a complete refurbishment was instigated and completed in 2013. We were selected for heating and we specified a concealed solution. The results have been rather good (see below) and internally we now refer to the hall as Logie Warmstone. Architecture and Design Scotland has written a fine case study about the refurbishment, see here for details. "There is a visitors’ book in the hall and the Trust has received many positive comments. Feedback has indicated that the space is now warm, bright and inviting. Hall users have commented on the incomparable comfort level the air source heat pumps and added insulation have offered. It is hard to ascertain whether true carbon savings are being made, as the hall is being used much more than it was before the refurbishment. It could be argued that as the hall is used more often, the community are gathering more frequently as a group in the hall, rather than heating several individual houses." The Phoenix Community Centre in Sandwich, Kent (Web site) was restored in phases from 2006 to 2010, and a range of environmental and ecological solutions was considered for each part of the restoration. Environmental Heating Solutions Ltd supplied the heating for the 1st phase in 2007 and also for the 2nd phase in the spring of 2010. There are now five units in all. Most of the time 2-3 units are used but all five may be used when it is cold. The Usk Centenary Hall (Web site) was built in 2008. The main hall is 13 by 17 metres and approximately 4 metres high. It has been heated by equipment from Environmental Heating Solutions since the start. The units are normally kept on 24/7 in the heating season. Aberdeen Council is keen to further the environmental agenda and is continously seeking to reduce its environmental impact. EHS was contacted in mid 2010 about the need to modernise the heating system at the Catherine St Community Centre in central Aberdeen (total size 532 m2). A number of presentations were made and EHS had to demonstrate a payback period of less than 5 years, which we could. Three ceiling mounted units were installed early in 2011, and an energy consumption meter was fitted in mid 2011. After a full winter season of heating the EHS solution has been proven to use only £745 which represents a saving of 81% compared to the previous heating system running costs. The council is now planning to roll out the EHS technology across its property portfolio. Centrally located within the village of Cornhill in Aberdeenshire this fine old stone building was costing around £3,500 a year to heat. Several options were investigated for renewable energy heating forms but were discounted - ground source heat pumps because there was no land available, air to water air source heat pumps because the existing radiators were the wrong type to work with low flow temperatures and under-floor heating was out of the question since a new sprung floor would be required. The Main Hall (measuring 14m x 9m x 6.4mH) offered an ideal situation for the EHS Energy Saver air to air Heat Pump solution, which had already been proven locally for more than two years in the garden centre in Forres. Planning consent was readily obtained as the outdoor units were proven whisper quiet and extremely unobtrusive. The first winter has now passed and the running costs are less than £500 a year with the system operating 24/7 during the heating season to ensure hall users always enter a warm space. Saving £3,000/year the heat pumps will enable payback within 3 years. The Village hall had been heated with oilfired underfloor heating, which cost an absolute fortune. A number of options including solar panels and ground source heat pumps were considered but rejected. EHS was contacted in October 2011 and two EHS Energy Savers were fitted in November 2011 heating the main space of 180 m2 with a ceiling height of about 5 metres. The performance of the units has been excellent and the underfloor heating was disconnected after only two months of Energy Saver usage as it was no longer needed.